It's the first time I've unfolded it since it arrived. 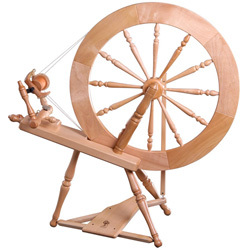 I found that it would have just about sat on my coffee table but I came to the conclusion that I'm now a little old for working bent double, so spent time putting together a stand / treadle kit. After some measuring up, a guess at a fullness ratio and some scribbled calculations (as if I knew what I was doing!) it seemed that I needed the full width of the loom and another 50 heddles on each shaft. 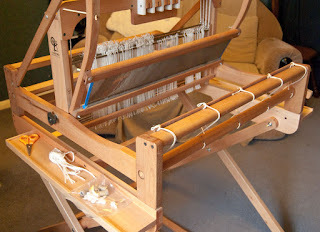 I have spun about 50g of the weft. 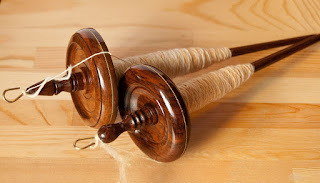 There are two spindles here because the maker asked me to try both of these designs and of course they both spin as beautifully as they look. I'm getting this done very quickly because I can't resist picking up one of these spindles every time I walk past!